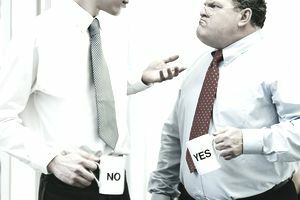 Arbitration sounds like a term you might have found in a union dispute a few decades ago, but it is more and more common in the business world. You'll run across it in employment contracts, credit card agreements, and retail contracts all the time, so it's good to know what it means and how arbitration works. In particular, you may have seen a mandatory arbitration clause in a contract. Arbitration is the process of bringing a business dispute before a disinterested third party for resolution. The third party, an arbitrator, hears the evidence brought by both sides and makes a decision. Sometimes that decision is binding on the parties. To arbitrate a matter is to bring it before an arbitrator. An arbitrator is a spectator, witness, or hearer. Arbitration is a form of alternative dispute resolution (ADR), used in place of litigation in the hope of settling a dispute without the cost and time of going to court. Litigation is a court-based process that involves a decision that is binding on both parties and a process of appealing the decision. The differences between arbitration and litigation involve the processes themselves and the result of decisions on the disputes. Arbitration is often confused with mediation, which is an informal process of bringing in a third party who goes between the disputing parties to help them settle a dispute. The mediation process is not binding on the parties, and the mediator does not hear evidence. The mediator meets with the parties for discussion. The mediator tries to bring the parties together by discussion and caucusing (a separate discussion). Litigation, arbitration, and mediation are all involved in settling business disputes. Arbitration )is the process of bringing a business dispute before a disinterested third party for resolution. The third party, an arbitrator, hears the evidence brought by both sides and makes a decision. Sometimes that decision is binding on the parties. Arbitrators are trained professionals who have expertise in specific areas of arbitration, including employment, labor, construction, commercial, and international disputes. The American Arbitration Association maintains a roster of arbitrators in these and other areas that the parties can use in selecting an arbitrator. According to the American Arbitration Association (AAA), here is the general process for arbitration. Filing and Initiation: An arbitration case begins when one party submits a Demand for Arbitration to the AAA. The other party (the respondent) is notified by the AAA and a deadline is set for a response. Arbitrator Selection: The AAA works with the parties to identify and select an arbitration based on the criteria determined by the parties. Preliminary Hearing: The arbitrator conducts a preliminary hearing with the parties, to discuss the issues in the case and procedural matters, such as witnesses, depositions, sharing information, and other matters. Information Exchange and Preparation: The parties then prepare for presentations and exchange information. Hearings: At the hearing, both parties may present testimony and evidence to the arbitrator. Unless the case is very complex, this is usually the only hearing before the arbitrator. Post-Hearing Submissions: After the hearing, both parties may present additional documentation, as allowed by the arbitrator. The Award: Finally, the arbitrator closes the record on the case and issues a decision, including an award, if applicable. Do I Need a Lawyer for Arbitration? It's a common myth that lawyers aren't allowed in the arbitration process. Anyone is entitled to have an attorney but it isn't required. You could have an attorney advise you outside of the actual arbitration setting. One of the benefits of arbitration is avoiding the cost of going to court, which includes the cost of hiring an attorney. Administrative costs, for paperwork, etc. Cost of the arbitrator at an hourly or daily rate. In recent years, the arbitration process has become more widespread, and many retailers, credit card companies, and other businesses are using mandatory arbitration in their contracts, requiring that customers consent to arbitration instead of litigation. Even though arbitration isn't cheaper or less time-consuming than litigation, many businesses have Arbitration clauses often include provisions that deny signers the right to pursue class action lawsuits, another huge saving for businesses and employers.